For the majority of the people, it is hard to imagine a day that doesn’t start with a cup of coffee. But, the true coffee fans need a lot more than that, like the precise texture and taste. This can only be achieved through the use of a good quality dual boiler espresso machine. Whether you need a machine for home use or you want to open your own barista house, we have jotted down the list of the best dual boiler espresso machines for all of your requirements. 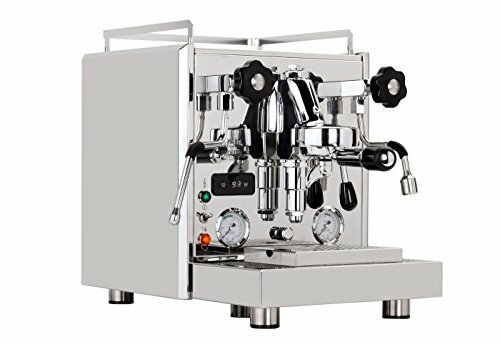 What is a Dual Boiler Espresso Machine? Who Should Get a Dual Boiler Espresso Machine? With its professional grade functionality and a minimal price, the Breville﻿﻿ BES920X﻿﻿L is a perfect espresso machine for every one of you. The Breville BES980XL has everything one can ask for in a dual boiler espresso machine. If you want to make your life easier, get this one. 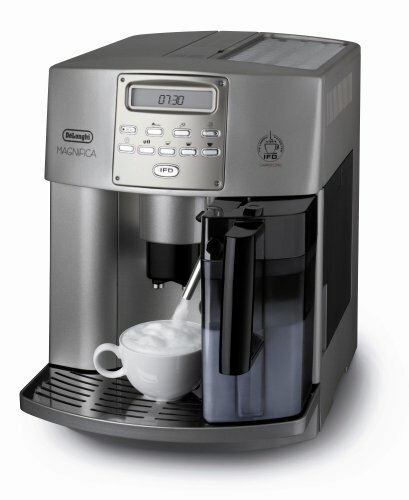 The DeLonghi ESAM3500.N Magnifica is for those of you cannot stand waiting, or simply don’t have enough time. This super-automatic machine will get your coffee ready in no time. If you want your coffee game on point while keeping your expense within your budget, then the La ﻿Spaziale﻿﻿ ﻿Mini Vivaldi II is the one for you. If you want a premium quality espresso machine that is not only easy to use but also delivers perfect results, go for the Profitec ﻿Pro﻿ 700. 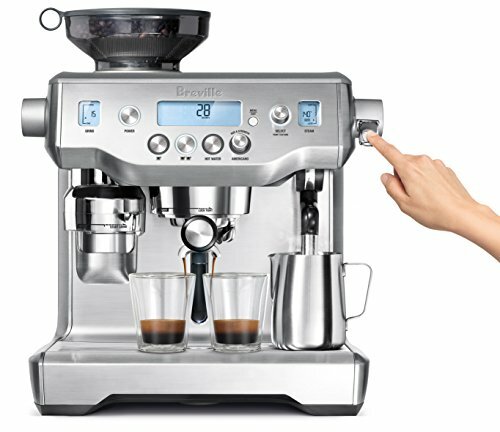 The Breville BES920XL is the best espresso machine with double boilers in the market so far, and that too in a small price. This machine comes with professional grade functionality and numerous features, making it our most favorite espresso machine. This machine, through its electronic PID temperature regulator, delivers the precise temperature control that is required for making the perfect cup of espresso. And the over-pressure valve of the machine ensures that the extraction pressure stays within the required limit. This high level of control results in an aromatic cup of flavorful espresso every single time. The machine also features pre-infusion pressure. This helps in getting a uniform extraction by slowly expanding the coffee grinds through gradual pressure. A backlit LCD display is also there that shows the brew temperature or time, making it more convenient to use. There is also an auto start setting that allows you to enter a specific time on which you want the machine preheated. Cleaning part of the machine is also a breeze. It comes with a descaling function for easy cleanup. And it also includes a razor dosing tool for constant and precise dosing. Long story short, this is the most awesome dual boiler espresso machine you can get your hands on. Our next pick is again from Breville and it is a slightly advanced model from the above one. So, needless to say, it costs a bit higher too. The Breville BES980XL is as excellent as the BES920XL and it comes with multiple eye-grabbing features. Although its price is slightly higher than our top pick, it is still a very affordable option, considering that it comes with two boilers. This machine makes coffee making easier and less messy by automatically grinding and dosing the coffee. Like the above model, the Breville BES980XL’s boilers are also made of stainless steel and are very easy to descale. The machine features 3 preset and 6 personalized settings. There is also a one touch Americano feature that pours the water directly into your cup after the extraction. Usage of this machine is very easy. You can just program the shot temperature as per your requirement and can see that on the display screen. The next best is the ESAM3500.N Magnifica by DeLonghi. This is a super-automatic espresso machine for those coffee lovers who do not have enough time on their hands. From the start time to the coffee’s temperature to the water’s hardness, every single thing in this machine is programmable. Therefore, you will find this machine extremely easy to use. The machine features the company’s original cappuccino system frother that always makes insanely creamy froth for your beverages. It has another patented system for brewing that instantly grinds the coffee beans. The professional grade burr grinder in the machine allows you to regulate the grinding of coffee beans as per your requirements.From extra mild to extra strong, there are 5 choices for coffee’s strength to pick from. In addition to all these amazing features, the machine is quite easy to clean and is completely dishwasher safe. 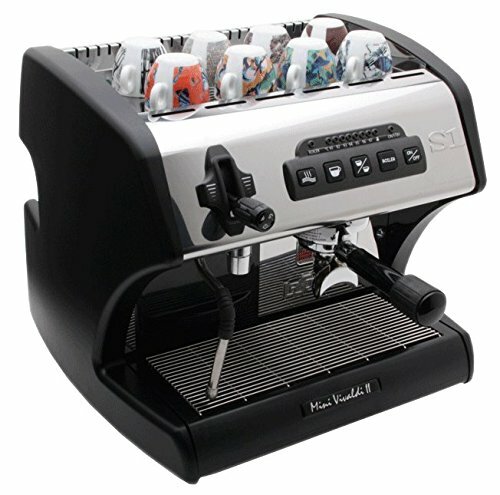 Moving on to the next one, we have got the La Spaziale Mini Vivaldi II. This is yet another great option if you don’t have a huge budget, but the quality is your need. The machine comes with a new and redesigned top cover and portafilters, making it more useful and functional than ever before. The machine features programmable off set differential that lets you set the exact same temperature on the LED that you want to deliver inside. The 0.9mm 4-hole steam tip delivers rich and foamy froth in a matter of a few seconds. And that too with a very little amount of milk. Lastly, the temperature precision is also pretty impressive in this model. Not even half a degree of temperature drop goes unnoticed in this machine. So, once you get it, you can expect to have barista style coffees whenever you want. And the last spot goes to the Profitec Pro 700, which is again a very premium quality espresso machine with twin boilers. Just like all of our other picks, this one also contains stainless steel boilers that are covered with thermal insulation for better conductivity. The boilers are easily removable, making the servicing or repairing of the machine easier for you. The machine features a powerful RPM motor along with a rotatory pump. Both of these not only reduce the brewing noise but also let you directly link the machine to either the reservoir or the water line. The machine has a very precise control over the temperature and pressure, resulting in excellent and café level coffee every time. As the name suggests, dual boiler espresso machines are the ones that contain 2 different boilers. These are also known as double boiler espresso machines. Unlike the conventional espresso machines for home use that come with single boilers, twin boiler machines are highly functional and deliver far better results. In fact, they are regarded as commercial grade espresso makers. Both of the boilers in a double boiler espresso machine come with their own separate heat and thermostat controls. This means you can set up different temperatures for both of them. This function really comes in handy while making excellent coffee. Because usually, the water you need for steaming your milk has to be hotter than the water that is added to the coffee grinds. And this is what gives you the barista style coffee every time. What’s best about having double boiler is that both of them can be put to use at the same time. You just need to put inside the water and regulate the temperatures of both according to the purpose. And you will get the water ready from both boilers without having to wait additionally. Since double boiler machines use the accurate heating temperature for both the functions, you are sure to get excellent and best results every single time. And they also minimize the time of coffee making to a great extent. On the other hand, if your machine has a single boiler, you will first have to regulate the temperature for less hot water for running it through the ground coffee. And then you will have to use the same boiler for hotter water for steaming your milk. Without any shred of doubt, you will get a remarkable coffee this way too, but the process is going to take forever. And you will not have the luxury to have a quick cup of coffee whenever you are in a hurry. That’s why it is always best to go for a machine with two boilers. As mentioned above, these machines come with two separate boilers. Both of these boilers come with their own particular functions. Let’s have a look at them both. Brew Boiler - Brew boiler is the one that is used for heating the water for extracting the flavor from your ground coffee beans. The water that gets heated in this boiler goes through the coffee and then comes out full of flavor, down into your cup. The water in this boiler gets heated at a much lesser temperature in comparison to the one in the other boiler. Steam Boiler - This boiler heats up the water to a much higher temperature than the above one. The water that gets heated in this boiler is used for frothing the milk. Having dedicated boilers help in getting perfect coffee every time. They minimize the risk of running the extra hot water through the coffee or using less hot water for frothing the milk and ensure that both of the functions are carried out properly. The majority of the dual boiler machines come with their individual controls that are very easy to operate. Some machines also come with digital thermostat controls, making it easier for you to set the exact temperature for each boiler. The basic material used in the construction of espresso machine boilers is metal. Why metal? Simple, because metals are better at conducting heat than other materials. Now which specific metal is used in their construction is not a hard and fast rule. There are generally three different metals that are used for making boilers. Those metals include brass, copper, and stainless steel. Let’s take a detailed look at each one of them. Copper is the most common material you will find in espresso machine boilers. Copper is preferred by the manufacturers because of its extraordinary ability to conduct the heat. For the same reason, copper delivers a very consistent water temperature. The majority of the conventional Italian espresso makers use copper built boilers. That is why; a lot of people prefer copper made boilers when it comes to choosing an espresso machine. Stainless steel is the second most common material used for constructing the boilers for espresso machines. Stainless steel’s prevalence is not as high as copper because of its high price. However, this doesn’t stop people from going for the stainless steel boilers because they are more health friendly than copper. Brass is also one of the metals used for making espresso machine boilers. It is cheaper in price in comparison to the above two metals. But, it is not as commonly used as the above two. The conductivity of brass is dependent upon its quality and the content of zinc present in it. For some people, the material doesn’t really matter. Those people are generally the ones that do not have much experience with espresso makers. But, the ones that have used a few machines in the past, they usually develop a preference for a certain type of material over the others. First of all, it cuts down the coffee making time to half or even lesser. Nobody likes to wait for a long time when they are yearning a good cup of coffee. A double boiler allows you to simultaneously take care of brewing and frothing, resulting in a quicker cup of perfectly made coffee. Excellent for use in urgent scenarios. In today’s world, everybody runs short on time, especially the job doing individuals. For such people, a double boiler espresso machine comes as a holy grail. You get to have commercial grade coffee in your own home. No need for running to a coffee shop every morning for kick starting your day. Being a one-time purchase, it saves you a lot of money in the due course. Double boiler machines provide much accurate and consistent result than the ones with a single boiler. Since both of the boilers in the machine are dedicated for their specific jobs, they ensure to provide the accurate water temperature for an impeccable cup of coffee. A lot of espresso makers come with digital thermostat controls making it easier for you to deliver precise heat to both of the containers. We’ll say that this machine is for every coffee lover. Whether you have experienced using such machines in the past or you want to try one now, you shouldn’t hesitate in getting one for you. From the ocean of numerous good espresso machines having double boilers, we have pulled out the BEST ones for you. All of the machines given on our list are highly functional and are exceptionally good for both personal and professional level use. So, you can pick anyone of them as per your budget. However, if this is going to be your first time with a double boiler espresso machine, we’d suggest you go for our top favorite, the Breville BES920XL. Not only is it the least expensive of them all, its functionality and performance are too good for its price. We are sure that you won’t regret your decision. We sincerely hope that we have been of some assistance to you.